Ivory + Mason Casual and Trouser Dress Socks for Men with colorful and cool design. Ivory Mason are perfect for every occasion. You can wear the classic cotton blend socks as a pair of casual socks at home, business socks at office, sports socks in the open air, dress socks for a date, wedding socks for a wedding, or a pair of socks for other occasions. The fashion design patterned socks have a comfort band around the opening of the sock, keeping them up all day. And the best cotton socks maintain their shape and color through multiple wash cycles. The men dress socks have the moderate thickness, not too thin or too thick, and these fashion socks slide right on and do not too far up the calf. Our men cotton casual socks absorb sweats well that keeps your feet dry and extremely breathable. All Ivory Mason products are offered under registered trademark and ONLY sold by Ivory Mason. We do not authorize any other sellers to sell our products on this or any other marketplace. We can not guarantee products quality of other sellers! 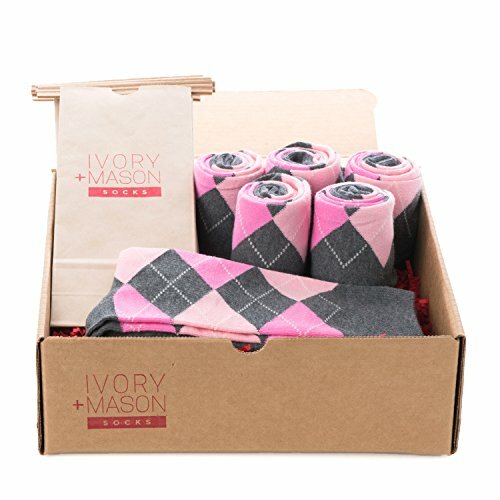 DRESS YOUR GROOMSMEN WITH STYLE - Ivory + Mason's Groomsman argyle dress socks provides one of the most unique wedding party socks on the market under 10 dollars. Our mission is to create the world's most comfortable pair of socks. Perfect for all year round and great gift for any occasion especially for your wedding day, groomsmen, best man and wedding parties. These argyle socks for men pair perfectly with a suit and dress shoes so your wedding photos will look unique, fashionable and fun. DANCE THE NIGHT AWAY COMFORTABLY - Our dress socks are made with a premium cotton blend including polyester and spandex. Our groomsmen socks are beneficial because they absorb moisture from your feet and it evaporates from the socks. We gaurantee your feet will feel comfortable while you dance wearing your dress shoes unlike Polyester socks. The socks contain 80% Cotton, 15% Polyester and 5% Spandex. Why not get some fun & happy socks for your family & friends. Socks sold in bulk of 6 pack. HAVE THE BEST PICTURES - Our dress socks for men argyle patterns are designed with love in Los Angeles, CA. Our creative director hand designs each pair to provide unique designs and ideal fit. Ivory + Mason has been featured in Oprah Magazine, Allure, OK! Magazine, Refinery29, E News, The View and many more publications and television outlets. VERSATILE SIZING - Sock size 10-13 will fit most men's shoes. This usually translates to a man's U.S. shoe size 6.5-13. (European 42-46, UK 7-12). Our styles can also be worn by women. This usually translates to a woman's U.S. shoe size 9-15. CUSTOM PACKAGING & PERFECT GROOMSMEN GIFT IDEA - All of our socks are nicely packaged so you can also gift our products for any special occasion. Our socks make the best Groomsmen gift idea but can be used for a Christmas gift and Birthday gift for men and women. Great for Christmas stocking stuffer gift. We have included an area on the back of the package where you can personalize each package. Our Men's wedding party socks styles go past your ankle. They come in a eco-friendly kraft packaging. If you have any questions about this product by Ivory + Mason, contact us by completing and submitting the form below. If you are looking for a specif part number, please include it with your message.